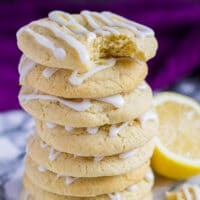 Soft and Chewy Lemon Cream Cheese Cookies – Deliciously soft, chewy, and thick cookies made with cream cheese for extra softness, and infused with lemon! The weather’s all over the place here in the UK. It’s very warm, yet we are still getting plenty of rain – typical. (I do enjoy the odd thunderstorm we get though!) Rain or not, the hot weather makes me want to bake with citrusy fruits, and bake with them I will. 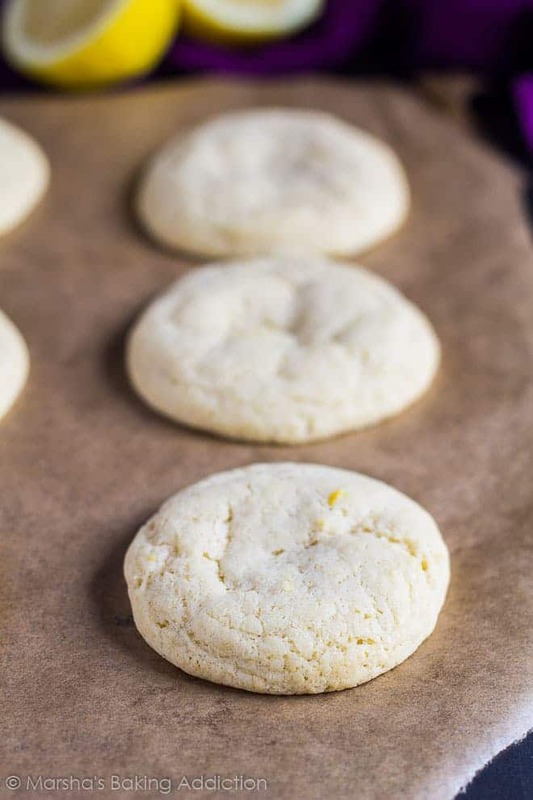 Today I bring you cookies that are made for summertime, perfect for those hot days – Lemon Cream Cheese Cookies! 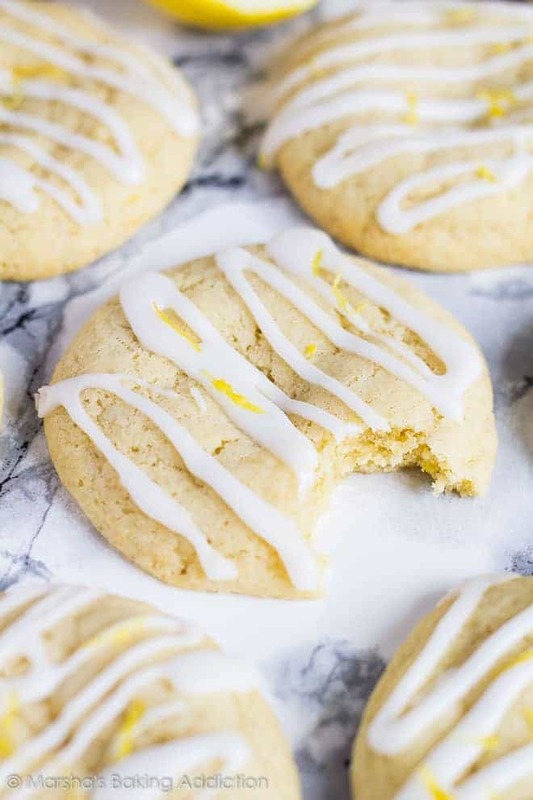 I’ve topped these cookies with a delicious lemon glaze and a sprinkle of lemon zest for an added burst of citrus in every bite. The cream cheese added to these cookies makes them extra soft and moist without actually making them taste like cream cheese. In fact, I find it makes these cookies taste more buttery! Bonus! Love lemon desserts? 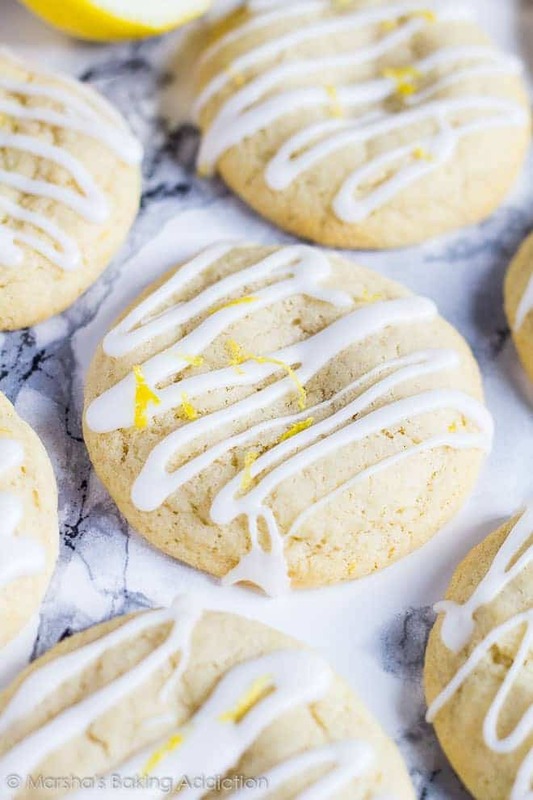 You need these cookies in your life! 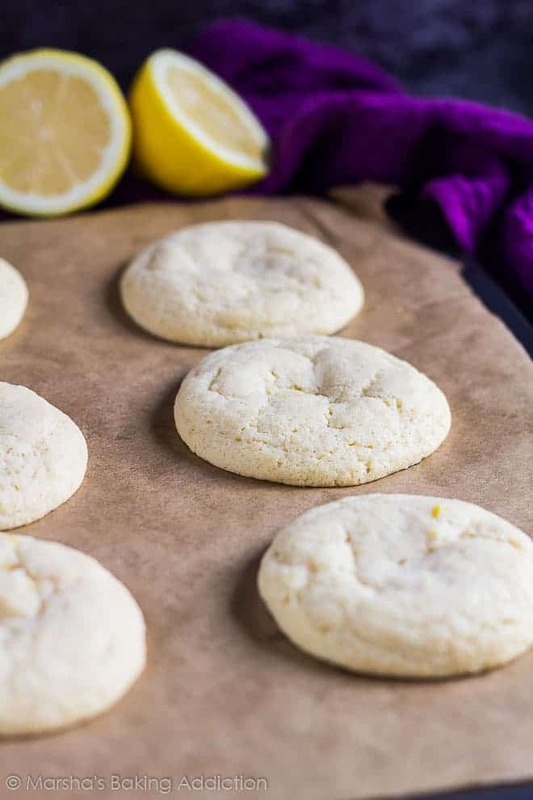 To make these cookies, whisk together the flour, baking powder, cornflour, baking soda, salt, and lemon zest. Set aside. Whisk together the butter, cream cheese, and sugar. Add the egg and mix until combined, then mix in the lemon extract. Fold in the dry ingredients. Roll the dough into 1.5oz balls, and place onto a baking tray lined with parchment paper. Bake for 10 – 12 minutes. Allow to cool on the baking tray for 5 – 10 minutes before transferring to a wire rack to cool completely. For the glaze, stir together the icing sugar and lemon juice until smooth and combined. Add more juice to reach desired consistency if needed. the perfect cookies for summer! How long will these cookies last? These cookies will stay fresh, kept in an airtight container, at room temperature for up to 1 week. Can I freeze these cookies? Yes, they freeze well for up to 3 months. Thaw overnight in the fridge. Prefer freshly baked cookies every time? Cookie dough balls can be kept in the fridge for up to 5 days, or frozen for up to 3 months. Bake from frozen. More cookies to try next! 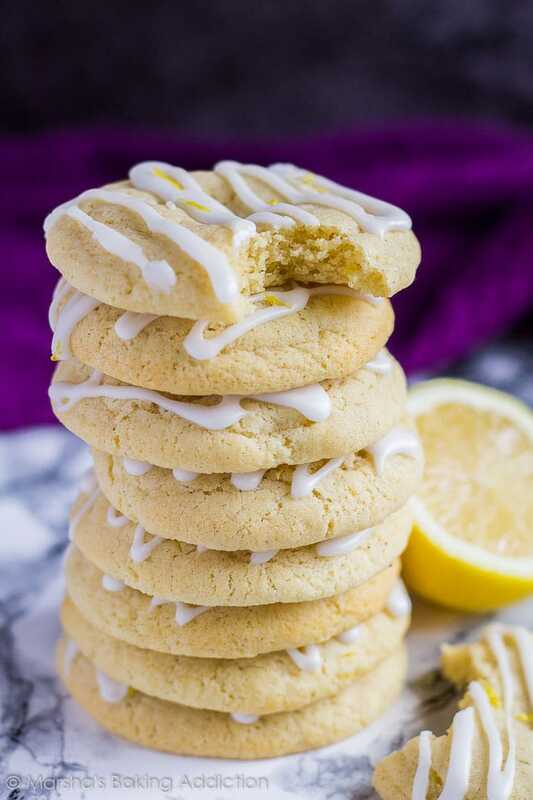 Deliciously soft, chewy, and thick cookies made with cream cheese for extra softness, and infused with lemon! Whisk together the flour, baking powder, cornflour, baking soda, salt, and lemon zest. Set aside. Roll the dough into 1.5oz balls, about 14 - 15 balls, and place on the prepared baking tray. Bake for 10 - 12 minutes. Allow to cool on the baking tray for 5 minutes before transferring to a wire rack to cool completely. Mix together the icing sugar and lemon juice until smooth and combined. Add more juice to reach desired consistency if needed. Drizzle the glaze over the cooled cookies, and enjoy! Marsha, I’m so glad the hot weather inspired you to make these cookies! 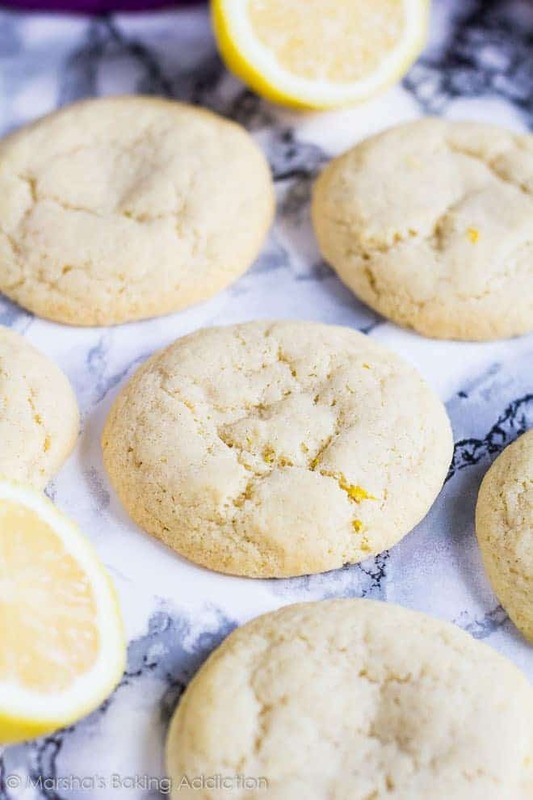 Lemon cookies are my sister’s absolute favorite. I have to try making these for her some time (if she’s nice to me… J/k!) These cookies look so unbelievably soft and just… perfect. Exactly what I’d expect from MBA. 🙂 Hoping you get another thunderstorm! 😉 Pinning! I wish I had this recipe last month when I had this tiny bit of cream cheese leftover and I did not know what to do with it!! Cookies! Bake into cookie! Thanks, I’m gonna save this for all the times I make a recipe that doesn’t dare to use an entire package of cream cheese! These sound delicious! 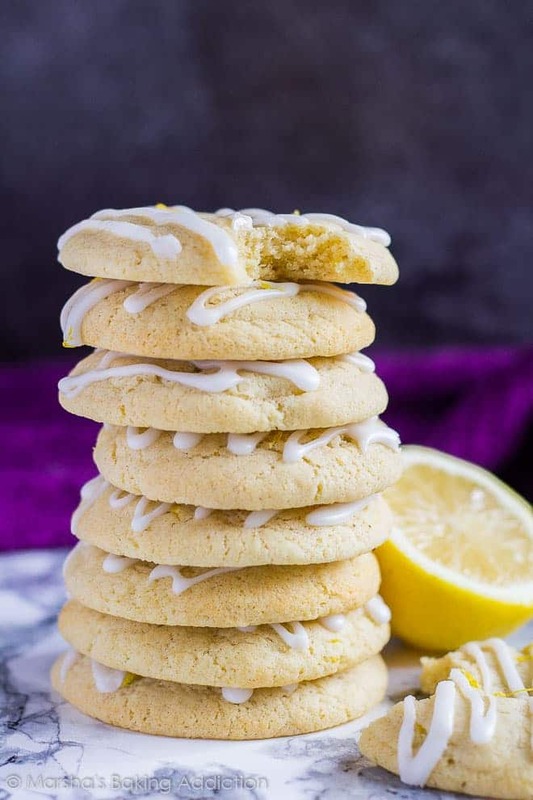 I love lemon-flavored baked goods, and cookies are just the right size for my sweet tooth. I’ll have to give these a try. Anything involving cream cheese makes me giddy! Love these cookies, Marsha! So soft and lemony! YUM! I’m glad we are not the only ones having crazy kookie weather. . .one minute it’s 90 degrees F out. . .and the next I’m shivering with my polar fleece on. Warm weather or not, these beauties are sure to bring a sunny disposition into my life. I love any and all things lemon. . .as a matter of fact it appears to be one of the most used ingredients in my house. If only I had a fresh batch of these zingy cookies sitting on my countertop. 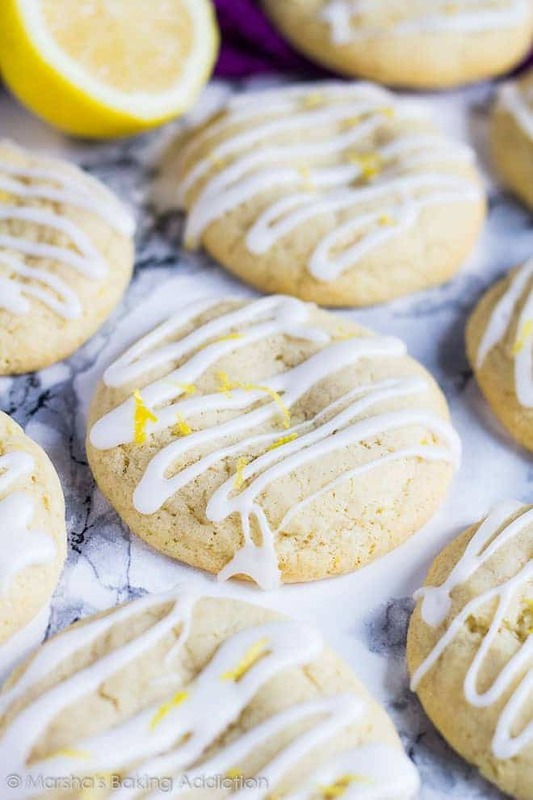 These cookies look so perfect for summer! That lemon is the best! These look so amazing! I love lemon everything! I need to try these. They look amazing!